Except for a five-game losing streak in late December, Houston has been consistently dominant through the season. James Harden has had an MVP-type year, and Chris Paul has provided the necessary leadership at point guard. The Rockets join Golden State as the best offensive teams in the league. But with the addition of Paul, P.J. Tucker and Luc Mbah a Moute, Houston has become one of the best at the defensive end, too. HOT OR NOT: Hot. Since Jan. 8, the Rockets have gone 38-5. MISSING DUE TO INJURY: Luc Mbah a Moute (shoulder). ODDS TO WIN NBA TITLE: 2-1. If not for a rash of injuries to key players, Golden State would have been right there with Houston for the best regular-season record in the NBA. The last month has been a major struggle for the Warriors, and Stephen Curry is expected to miss the first round of the playoffs. But with Kevin Durant, Draymond Green and Klay Thompson all back, they're still a formidable, battle-tested group that could win a title — especially if Curry returns to the lineup at some point. HOT OR NOT: Not. Beginning with a March 9 loss to Portland, they are 7-10. MISSING: PG Stephen Curry (knee), SG Patrick McCaw (back). ODDS TO WIN NBA TITLE: 4-1. Portland put together an impressive 13-game run in February and March to guarantee a fifth straight playoff berth. But then Moe Harkless and Ed Davis went down, and clinching homecourt advantage in the first round of the postseason has not come as easily. 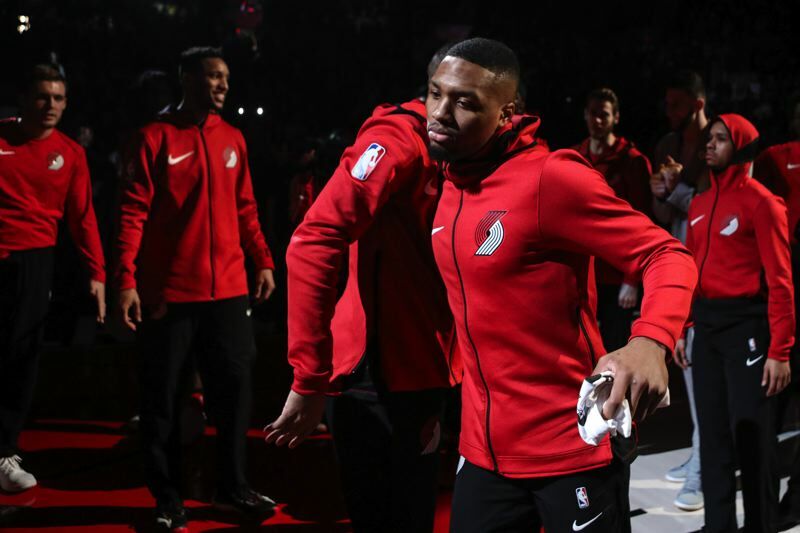 With Harkless and Davis back and a healthy Damian Lillard, the Blazers should be able to beat any team they face in the first round. The next opponent, presumably Houston or Golden State, would be another story. HOT OR NOT: Hot, then not. The Blazers put together an 18-3 record from Feb. 14 to April 1. They were 5-7 in their last 12 games. MISSING: SF Moe Harkless (knee). ODDS TO WIN NBA TITLE: 25-1. With the Big Three of Russell Westbrook, Paul George and Carmelo Anthony, the Thunder were expected to challenge Houston and Golden State for supremacy in the West. It hasn't happened. Westbrook has had a less-than-MVP-like season, and Anthony has been a major disappointment. OKC has had win streaks of eight and six (twice), but has never really gained momentum. The Thunder could win a first-round series, but that's likely where it would end. HOT OR NOT: Not. Since March 20, the Thunder are 5-5. MISSING: SG Andre Roberson (knee). ODDS TO WIN NBA TITLE: 35-1. The Jazz survived a midseason injury to center Rudy Gobert and have, along with Houston, played the best basketball in the NBA over the past 2 1/2 months. Coach Quin Snyder's crew has used an efficient offense and a stifling defense. Biggest problem in the playoffs would be lack of veteran leadership and offensive firepower. Point guard Ricky Rubio has been playing with a sore hamstring, another source of concern. HOT OR NOT: Hot. Since Jan. 24, the Jazz are 29-6. ODDS TO WIN NBA TITLE: 30-1. With the Twin Towers, Anthony Davis and DeMarcus Cousins, and improving point guard Jrue Holiday, New Orleans looked like a team that could do some postseason damage. When Cousins was lost for the season in late January, the playoffs seemed a pipe dream. But Davis has taken his teammates on his back to an excellent second half of the season. A first-round playoff win would be a major achievement. HOT OR NOT: Hot. Since Feb. 10, the Pelicans are 20-8 and have won six in a row. MISSING: C DeMarcus Cousins (Achilles tendon). ODDS TO WIN NBA TITLE: 40-1. With its best player, Kawhi Leonard, sidelined for nearly the entire season, San Antonio has fallen short of the 50-win mark for the first full season since 1996-97, Gregg Popovich's first season as coach. But LaMarcus Aldridge is playing superbly, and the Spurs have plenty of veteran leadership from players such as Manu Ginobili, Tony Parker, Pau Gasol and Rudy Gay. If they stay healthy, they'll be a difficult out against anybody in the playoffs. HOT OR NOT: Hot. Since March 13, the Spurs have won 10 of 15 and 11 straight at home. MISSING: SF Kawhi Leonard (quad). It's been a great step forward for Minnesota after winning 31 games a year ago. The Timberwolves suffered a major blow when their leader, Jimmy Butler, went down to a knee injury in February, or they may have earned homecourt advantage in the first round of the playoffs. Butler is back, and he joins with Karl-Anthony Towns and Andrew Wiggins to give the Wolves a trio that could give any postseason opponent fits. HOT OR NOT: Not. Since March 1, the Timberwolves are 9-9. ODDS TO WIN NBA TITLE: 50-1.